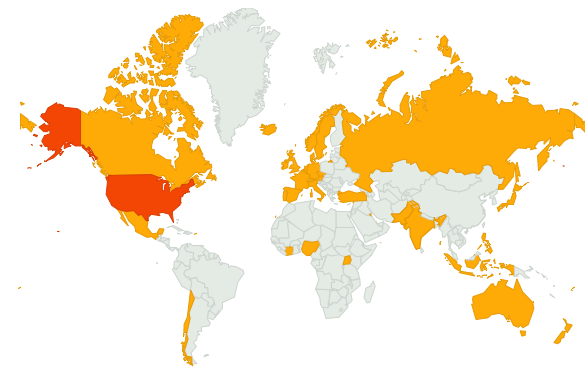 As of today, viewers of the Hawaiian Kingdom Weblog are from the following countries. The listing of countries is by priority of number of views and not by alphabetical order. United States, Australia, Canada, Japan, United Kingdom, New Zealand, Italy, Philippines, Germany, India, France, Austria, Switzerland, Turkey, Netherlands, Iceland, Norway, Spain, Denmark, Côte d’Ivoire, Qatar, Iceland, Timor-Leste, Sweden, Puerto Rico, Singapore, United States Minor Outlying Islands, Nigeria, Belgium, French Polynesia, Uganda, Luxembourg, Indonesia, Kuwait, Czech Republic, Chile, Saint Lucia, Portugal, Fiji, Russian Federation, Mexico, Brunei Darussalam, Pakistan, Virgin Islands, and Hong Kong. This entry was posted in International Relations by Hawaiian Kingdom. Bookmark the permalink. Aloha Keakua, for this latest update…posting to all sites and our tweeter site of over 1,000 followers, after one month. Many have written to the Hawaiian Kingdom Law Office and Na Aha Maluhia about how happy they are about the progress of Dr. Saiʻs work and would like to put into their complaints as foreigners and nationals for injury charges include; causes, civil, criminal and mixed, maritime and probate, personal and real property issues…is it by country or by jury, & trials upon debate in baanco business of the judge at chambers; and proceedings? This is wonderful to realize — going all around the world. I long for the day when I can just say that I live in the Hawaiian Kingdom. Awue!! Beautiful! Its amazing to know that most of those countires are our friends by treaties! I would like to send my deepest aloha from the HK to all our old friends and new friends accross the seas! This give me a little more confidence that the world knows about the HK! Under Internatioanl Law, Geneva, and Hague Conventions, Hawaii is still a country and is still been your friend and will be your friend! And I still stand scared and wonder when and if our government get restored! Aloha! you can — it may be uncomfortable at first because of all of the brain washing — but with practice, it will become a natural thing and more importantly, you will be educating others.